Tens of thousands of protesters rallied in Moscow Tuesday against President Vladimir Putin and a new law that levies a $9,000 fine for those in demonstrations that harm people or property. MOSCOW - Demonstrators gathered in a drenching rain in central Moscow Tuesday, in a show of defiance toward a government that evidently hopes to bring an end to the large gatherings protesting Vladimir Putin that began here six months ago. A march held last month ended in chaotic clashes between protesters and riot police, and the Kremlin, warning of rising radicalism, rushed to adopt tough measures against protesters. Among the official moves was to push through Parliament a law that levies fines of $9,000 for individuals participating in rallies that cause harm to people or property - a devastating penalty in a country whose average yearly salary is around $8,500. But as 10,000 protesters, by police estimates, began to march - some under umbrellas and others soaked to the skin - many of them said the new measures had deepened their resolve. And some spoke about the police and their sanctions with open mockery. Throughout the morning, Moscow had the muggy closeness of a gathering thunderstorm and the authorities hemmed in the route of the march with riot police officers, fencing, and heavy trucks and other vehicles. Much of the city looked deserted - Tuesday is Russia Day, a holiday - and the state emergency service issued a statement warning of high winds that could bring down power lines, billboards, and small trees. An hour before the event was to start, the website of the Dozhd television station, which has given blanket coverage to the opposition marches, was paralyzed by a hacking attack, its editor told the news agency Interfax. On Monday, seven key opposition leaders were suddenly served with official summonses to report for questioning in relation to a criminal case - apparently in an effort to strip the event of its headliners. Most of them conceded: television star Kseniya Sobchak, liberal organizer Ilya Yashin, and anticorruption blogger Alexei Navalny all reported to the Investigative Committee for questioning at 11 a.m., waving cheerfully to photographers on their way in. 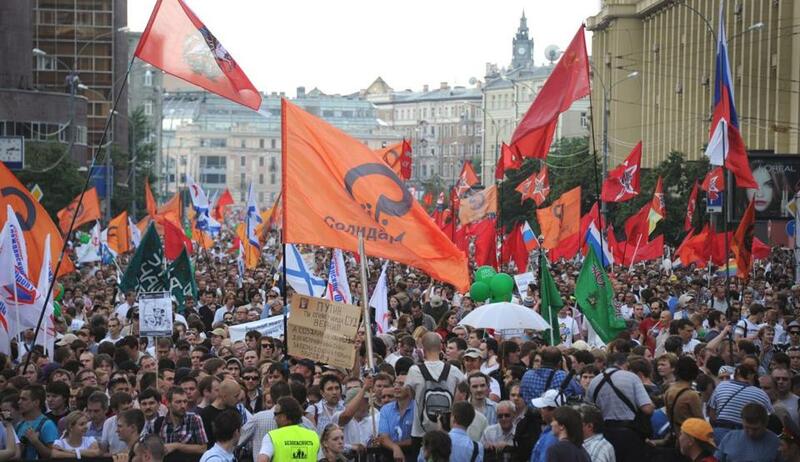 The leftist Sergei Udaltsov decided to defy the summons and attend the march. Udaltsov’s lawyer showed up instead, delivering a statement explaining that, as an official organizer of the demonstration, it would be irresponsible for him not to be present. Ivan A. Mefenko, 25, the director of an Internet cafe, said he had not been sure whether to attend until the raids that took place Monday, which were documented on a minute-by-minute basis via Twitter and Web news sources. “We’re hoping they will start to listen, at last, to the opinions of the people,’’ he said.